What Stewart Horn, writer and musician, is up to. The ginger Nuts of Horror is run by Jim McLeod and he always has some good stuff going down. He let me do this and he’s published it. Go check it out everyone. Starers, by Nathan Robinson – Book Review. 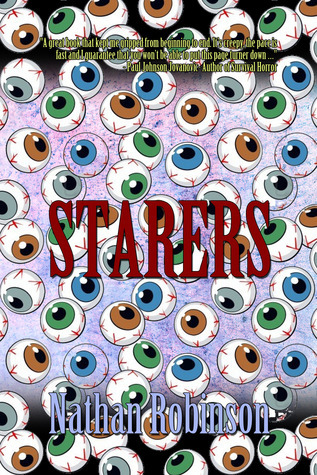 I’ve read several of Nathan Robinson’s short stories, including his excellent collection Devil Let Me Go and I’ve generally enjoyed them, but Starers is the first substantial piece of his I’ve encountered. And I was impressed. He starts by introducing us to a normal family: a married couple, their teenage daughter and his drunken brother. He doesn’t rush the first part of the book, but it doesn’t drag – we get involved and interested in the kind of problems that any family might encounter. The relationships are handled sensitively and I got a feel very quickly for the family dynamic. The first strange thing we see is an old man standing at a bus stop, then a neighbour standing naked in her garden just staring at the family’s house. More people join the crowd and nobody does anything – they just stand there and stare. And it’s the creepiest and most effective thing I’ve read this year. The build of tension and the strain on the already fragile familial relationships are beautifully portrayed, and the implied, non-specific threat of the ever-growing horde of starers makes for a claustrophobic and volatile atmosphere, which inevitably escalates. I’m reluctant to tell you more for fear of spoiling your enjoyment if you read it, but a crowd of people standing watching a house is only the appetizer – much more stuff happens as the story progresses. This is self-published, and there are a few small slips in grammar or style, but nothing that will stop you having a great time with this book. I hope that one day soon Mr. Robinson can land a proper publishing deal and get a professional editor to work with to give his work that final polish. As it stands though, it’s a more satisfying and certainly a scarier book than several things I’ve received from mainstream publishing houses in the last few months. 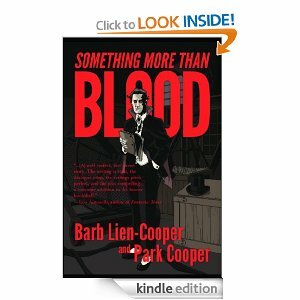 Book Review: SOMETHING MORE THAN BLOOD, by Barb Lien Cooper and Barb Lien Cooper. An old Hollywood B-movie director, already dying of cancer, is suddenly and brutally murdered in his hospital room. The word revenge is written in his own blood on the wall above his bed, in an exact copy of a scene from one of his early films. Suspicion falls on the film’s star, Lykan Fuller, who has big teeth and doesn’t seem to have aged in the intervening decades, and while held at gunpoint by the dead man’s granddaughter, he tells her everything. The format is lifted almost directly from Interview with the Vampire, but it’s an entirely different book. Set mainly in America in the first half of the 20th century, the backdrop to the story is burlesque theatre and early cinema. The authors have clearly done their research, but more than that they demonstrate an affection and enthusiasm for the subjects making me want to like them. This was the aspect of the book I enjoyed most. The story also straddles two world wars, and Lykan is German and Jewish, so Nazism is dealt with, and there is some subtext about prejudice and intolerance in general, though it’s not a preachy or self-righteous book. It’s mainly about the story, which is fun and for the most part pretty pacy. The prose lets it down a little – it’s somewhat plodding and lacks the style and subtlety that could have drawn us more deeply into Lykan’s assorted plights. We see his peril and are told his adventures, but I was never tense or afraid for him. Ironically for a vampire, he never really came to life. I also had a problem with the voice, which was contemporary American and never quite fitted with the 100-year-old German character. But then I’m really difficult to please. Having said that, I’m glad I read it to the end – the ambiguity of the ending is perhaps the cleverest and more satisfying part of the book. Overall, I enjoyed reading SOMETHING MORE THAN BLOOD. The setup and the vampire protagonist are both good, and the little details about early cinema are fun. A decent story, competently told, but lacking any real depth. I thought I should list the places where you can read my fiction or watch me play, so here’s a little list of links. Simply googling my name would probably bring them all up, and more. My story Filmland was published in the Horrorzine, and reprinted in their best of anthology, A Feast of Frights. It will also appear in the forthcoming best of best of anthology, featuring the highlights from their first four books. A wee Christmas story of mine was in the Christmas 2011Estronomicon, the ezine from Screaming Dreams Press. My poem The Parting was selected for a National Galleries of Scotland print collection, but I don’t know which one – I’ve never actually seen the book. My story A Glimpse of the Future is in the July 2013 issue of Lovecraft eZine, and you can hear read aloud in the issue 25 podcast. Filmland is due to be podcast soon by the excellent Tales to Terrify. There is some music-related stuff and videos mainly of me playing guitar on my YouTube channel. I appear on some other people’s videos as well if you search for me. Everybody is odd; everybody is normal.